Current Status: merged into Morning Star Lodge, 12/21/2004. By Right Worshipful Will Allen Gray. We are gathered here tonight to observe the twenty-fifth anniversary of the constitution of Isaiah Thomas Lodge, which occurred on January 19, 1921. The intervening twenty-five years have been years of sincere and practical Masonic service, and ritually, socially and economically the affairs of the Lodge have been executed in a truly Masonic manner, and with the best interests of the Fraternity, the Lodge as a whole and the individual members at heart. The relationship of the Lodge with the Grand Lodge and with other Lodges located in the vicinity of Worcester has been excellent, and the officers and Brethren through the years have shown a devotion and a unity of purpose that has resulted in close approximation to the ideals of our institution. A Masonic spirit has prevailed which has not faltered or grown dim. Late in the year 1919, it became evident to certain prominent members of the Masonic Fraternity in Worcester that in view of the increase in the number of applications for the degrees, and in view of the probable continuance of a reasonable number of applications, the time had come to consider the advisability of forming a new Lodge, and on December 19th of that year, a letter, signed by R.W. Fred W. Leavitt, was sent to several local members of the Craft who might be interested, requesting them to attend a meeting to be held in the Directors' room of the Masonic Temple, to consult with each other in regard to the matter. This meeting was held on January 7, 1920, at 7:45 o'clock in the evening, and twelve Brethren met as requested, with R. W. Frederick W. White as Chairman and R. W. Edward Minton Woodward as Secretary. All present expressed themselves in favor of petitioning the Most Worshipful Grand Lodge to charter a new Lodge in the city of Worcester. It was also agreed to give the members of the Worcester Masonic Charity and Educational Association the privilege of being Charter Members if they so desired. The fee for Charter Members was fixed at $25.00 each, and Isaiah Thomas Lodge was suggested as a name. At a second meeting held one week later, on January 14, 1920, at which nineteen Brethren were present, it was voted that R.W. Fred W. Leavitt should be the first Master of the new Lodge, and that the four Masonic Lodges in Worcester, then existing, should be requested to give their consent that a petition might be sent to the Most Worshipful Grand Lodge for the chartering of the new Lodge, and a committee was appointed to suggest names for the offices of Senior and Junior Wardens. At the next meeting, held on January 21, 1920, R. W. Matthew J. Whittall was nominated for the office of Senior Warden and Bro. Edward Milton Woodward for the office of Junior Warden, and these nominations were confirmed. It was also decided that the regular communications of the Lodge should be held on the fourth Thursday of each month. At a meeting held on February 26, 1920, at which R. W. Frederick W. White, District Deputy Grand Master for the 21st Masonic District, presided, a dispensation from the Most Worshipful Grand Lodge was read, authorizing the institution of the new Lodge. Wor. George C. Halcott was nominated for Treasurer and Wor. Harry S. Green for Secretary, and they were confirmed. R. W. Brother White then declared that Isaiah Thomas Lodge was duly organized under dispensation and that it was ready to act on any business that might legally come before it. He then resigned the East to R.W. Fred W. Leavitt, the first Master, and Isaiah Thomas Lodge began its Masonic career. The striking fact about this whole procedure is the speed with which the organization of the new Lodge was effected. Less than two months elapsed between the date of the first meeting that was held and the date of institution. The fee for the degrees was fixed at $100.00 to conform to the fees in other Lodges in the city. The fee for membership by affiliation was fixed at $25.00. The Lodge being under dispensation at the time, and having no regalia of its own, Morning Star Lodge granted temporary use of its regalia for as long a period as was necessary. The first regular communication of Isaiah Thomas Lodge was held on March 25, 1920, and immediately ten applications for the degrees were submitted and referred to investigating committees. The first special communication was held on May 6, 1920, and four candidates were initiated. The Fellow Craft Degree was conferred for the first time on June 10, 1920, and four candidates were passed, and the Master Mason Degree was conferred for the first time on July 28, 1920, and four candidates were raised. The first official visitation to Isaiah Thomas Lodge was made by R. W. Frederick W. White, District Deputy Grand Master, for the 21st Masonic District, on November 11, 1920. The first death among the membership of the Lodge was that of R. W. Thomas T. Booth, a Charter Member, who died on December 20, 1920. He was Past Master of Quinsigamond Lodge, Past Junior Grand Warden of the Grand Lodge and Past District Deputy Grand Master. Even while existing under dispensation, the Lodge attracted the interest of many of the Brethren, and Brother Herbert Wesby, a member of Morning Star Lodge, presented to Isaiah Thomas Lodge a piece of wood that formed a part of the original coffin that held the remains of the late Most Worshipful Isaiah Thomas, for whom the Lodge is named. Brother Elmer H. Loring, a Charter Member of the Lodge, also contributed a gavel. After eleven months under dispensation, on January 19, 1921, which was the one hundred and seventy-second anniversary of the birth of Most Worshipful Isaiah Thomas, the Lodge was duly constituted by M. W. Arthur D. Prince, Grand Master of Masons in Massachusetts, and other officers of the Grand Lodge, under the provisions of a Charter issued by the Grand Lodge on December 8, 1920, with R. W. Fred W. Leavitt, Master; R. W. Matthew J. Whittall, Senior Warden; Bro. Edward Milton Woodward, Junior Warden, Wor. George C. Halcott, Treasurer and Wor. Harry S. Green, Secretary, all of whom were installed into their respective stations, and Isaiah Thomas Lodge became a regular and duly constituted Lodge, with twenty-seven Charter Members recorded. Photographs of the Charter Members, artistically arranged and framed, were presented to the Lodge by R. W. Herbert P. Bagley. Regalia and paraphernalia, including a beautiful Bible, were given to the Lodge by Brother James Montgomery. The first five Masters who served the Lodge were all Charter Members. Following them, those Brethren who have served as Masters were taken from the regular membership of the Lodge. A set of By-Laws was prepared, which was approved by the Most Worshipful Grand Lodge. Isaiah Thomas Lodge began fraternal relationships with the Lodges in Worcester and vicinity almost immediately, and visits were made and returned with the Worcester Lodges and with some of those in the county towns. On January 19, 1922, the Brethren of Thomas Lodge of Palmer paid a fraternal visit to Isaiah Thomas Lodge, and R.W. Ernest E. Hobson read an address which was delivered by M. W. Isaiah Thomas in Thomas Lodge on September 13, 1820. Wor. Henry W. Heath, Past Master, presented to Isaiah Thomas Lodge a gavel which was made from wood taken from the Washington elm in Palmer. Isaiah Thomas Lodge has been generous in its contributions to various Masonic activities, so far as its finances would permit. Early in its existence, an amount of $1000.00 was contributed to the Building Fund of the Masonic Temple in Worcester; $75.00 to the Rainy Day Fund of the Grand Lodge; and $20.00 for the entertainment of veterans at the hospital in Rutland. The Lodge also underwrote a contribution of $1.00 per member for the George Washington Memorial at Alexandria, Virginia. At a special communication held on January 18, 1923, the Lodge celebrated the birthday anniversary of Most Worshipful Isaiah Thomas and also the second anniversary of the constitution of the Lodge. Wor. William C. Mellish, Past Master of Athelstan Lodge, delivered an interesting address upon the life of Isaiah Thomas. The Brethren of Isaiah Thomas Lodge were greatly shocked at the death of Wor. Edward Milton Woodward, the third Master of the Lodge, who passed to the celestial Lodge above on August 3, 1923, while he was in office as Master. He was a Charter Member of the Lodge. Wor. Brother Woodward was beloved by all who knew him. His quiet, dignified and unassuming attitude of life, his sterling qualities and his strength of character endeared him to officers and Brethren alike. The Lodge suffered a definite loss in his passing. Masonic funeral services were held in the Grecian Chamber of the Masonic Temple. After the By-Laws were adopted, it was found that no provision had been made for a Charity Fund and therefore one was created in 1924. Wor. William W. Brown contributed $1000 as a basis for the Fund. Wor. Brother Brown was especially generous towards Isaiah Thomas Lodge, and on September 22, 1927, he presented to the Lodge an amount of $5000, to be kept separate from the other funds of the Lodge, and creating a fund to be known as the "William W. Brown Relief Fund." The fund has grown consistently and now amounts to nearly $7000. Isaiah Thomas Lodge has granted releases of jurisdiction that new Lodges might be formed in Worcester and vicinity, and Rose of Sharon Lodge in Worcester, Joel H. Prouty Lodge in Auburn, and Matthew John Whittall Lodge in Shrewsbury have been chartered. The Lodge has been especially interested in Matthew John Whittall Lodge in Shrewsbury because R.W. Brother Whittall, for whom the Lodge is named, was the second Master of Isaiah Thomas Lodge. As visible evidence of its regard, Isaiah Thomas Lodge paid a fraternal visit to Matthew John Whittall Lodge on October 19, 1928, and presented a Holy Bible. Isaiah Thomas Lodge voted in 1928 to contribute $10.00 from each initiation fee to the Worcester Masonic Charity and Educational Association to be devoted to the care of the Masonic Temple. On April 12, 1928, the first Past Master's Night was held, and one has been held annually since that year. Hiram Associates of Clan Scott and the Crafts Club have assisted in conferring degrees in Isaiah Thomas Lodge. On December 11, 1930, the officers of Germania Lodge of Boston paid a fraternal visit to Isaiah Thomas Lodge and conferred the Master Mason Degree on Brother Carl Claus Chevalier. The degree was conferred in German, by permission of Most Worshipful Herbert W. Dean, Grand Master. The Lodge returned this visit on April 27, 1931. When the Masonic Home was established in Charlton, many Lodges throughout the jurisdiction assisted in various ways in providing furnishings. Isaiah Thomas Lodge, being occupied during the first years of its existence in providing means for its own survival, had done nothing, but in 1932, when Worshipful Frank R. MacNiven was Master, an opportunity occurred for the Lodge to do something in this direction. It came to the attention of the Lodge that the Home was greatly in need of a communion service, as none had ever been provided. This seemed to be a time when Isaiah Thomas Lodge could do something really worth while for the Home and accordingly, a communion service was procured. On Sunday morning, February 21, 1932, a delegation from the Lodge went to the Home and formally presented it at an assembly held in the chapel. The presentation was made by R. W. Will A. Gray, Past Master of the Lodge, and Most Worshipful Curtis Chipman, Grand Master, who was present, accepted it in behalf of the Grand Lodge of Massachusetts. On Sunday, October 29, 1939, Worshipful Stanley W. Johnson, Master of Isaiah Thomas Lodge, planted a tree at the Masonic Home in Charlton and dedicated it to Most Worshipful Isaiah Thomas, for whom the Lodge is named. There were thirty Brethren of Isaiah Thomas Lodge enrolled in the Armed Services of the United States in World War II, one of whom made the supreme sacrifice. During the twenty-five years of its existence, the Lodge has been honored by the appointment from its membership of two District Deputy Grand Masters for the (Brookfield) 21st Masonic District — R.W. Will A. Gray, who served for three years, 1931, 1932 and 1933, being appointed by M.W. Herbert W. Dean and M.W. Curtis Chipman, and R. W. Clifford W. Greene, appointed by M. W. Samuel H. Wragg, the present Grand Master, and who is now in office. On September 26, 1940, the By-Laws of the Lodge were amended by increasing the Life Membership fee from $125.00 to $300.00. Isaiah Thomas Lodge has taken part in all of the exemplifications of the work and lectures of the three degrees since its institution, and the commendation of the Grand Lecturer has been expressed on a number of occasions. For entertainment and social activities, numerous pitch parties, ladies' nights, smokers and movies have been held, but the main efforts of the Lodge have been devoted to purely Masonic activities. Several installation ceremonies that were open to the public have been held, at each of which there was a large attendance. During its existence, the Lodge has had the services of four Secretaries: Wor. Harry S. Green, who served under dispensation and for one year thereafter; Bro. Wellesley M. Lawrence, who served for five years; Bro. Herbert E. Reed, who served for eighteen years; and R.W. Clifford W. Greene, the present Secretary, who has served one year. On June 19, 1942, the Lodge observed the 50th Masonic anniversary of Brother Herbert E. Reed, who was the Secretary at that time and who served acceptably in that office for a period of eighteen years. As this membership of fifty years is attained by comparatively few Masons, it should, perhaps, be given special mention. Brother Reed was raised in King Cyrus Lodge, Stoneham, on June 15,1892; affiliated with Isaiah Thomas Lodge on December 22, 1921, and was installed Secretary of Isaiah Thomas Lodge in November, 1926. He was District Representative to the Board of Masonic Relief of Grand Lodge for sixteen years and elected Lodge Representative to the same body in October, 1929. He was appointed District Deputy Grand Secretary for the (Brookfield) 21st Masonic District in December, 1930, by R.W. Will A. Gray, and served in that position during the term of each succeeding District Deputy Grand Master through 1944, a total of thirteen years. He was presented a Joseph Warren Medal on November 25, 1935, and presented a Veteran's Medal for fifty years continuous membership in the Fraternity on June 19, 1942, by R. W. George D. Robertson, then District Deputy Grand Master for the (Brookfield) 21st Masonic District, with a letter of commendation from Most Worshipful Albert A. Schaefer, the then Grand Master. He was also presented an engrossed certificate, framed, bearing the names of all of the Past Masters of Isaiah Thomas Lodge, the then present officers, and a purse of $50.00. The Lodge regretted that, because of physical disability, Brother Reed felt it to be his duty to relinquish the duties of the office of Secretary at the end of 1944; but the good wishes of the Lodge are with him and it is hoped that he will be able to enjoy many of the activities of the Lodge as time progresses. The membership of the Lodge on August 31, 1945, was 307. Starting with a membership of 27 when chartered, the Lodge has increased a net of 280 members in twenty-five years — an average of slightly over 11 members per year. Of the original charter members, five are now living. Every Master of the Lodge has been concerned with matters pertaining to relief, and Brethren have been aided when necessary. Many of our Brethren who have been unfortunate temporarily or permanently have been materially assisted in many ways. It has not always been a question of financial relief and officers and Brethren have freely given of their time and service in cases of necessity. During the years, all candidates have been examined in open Lodge in the lectures of the three degrees, as provided in the By-Laws. The thanks of the Lodge are due to those Brethren who have been willing to serve as instructors, for they have rendered a service to each candidate that will be of lasting benefit. This, my Brethren, is a very brief history of the doings of Isaiah Thomas Lodge during the first twenty-five years of its existence. The Charter Members of this Lodge were prominent in the civic, business and Masonic life of the community. They built a firm foundation for the Lodge, and their successors have endeavored to erect a structure upon it that is worthy of their aims. It is evident that the Lodge has become an active part in the Masonic life of the City of Worcester, and the record is complimentary to all who have had a part in its growth and development. It is reasonable to expect that the policies which have been proved to be successful will be continued, and that we can look forward to greater accomplishments in the years that are to come. By Right Worshipful Clifford W. Greene. On January 7, 1920 twelve Brethren representing the four Masonic Lodges in Worcester, met in the Directors' Room of the Masonic Temple, Ionic Avenue, Worcester, Massachusetts and expressed themselves in favor of petitioning the Most Worshipful Grand Lodge of Masons in Massachusetts to charter a new Lodge in this city and becoming Charter Members of the same; and inviting members of the Worcester Masonic Charity and Educational Association to become Charter Members, with fees for Charter Members to be set at Twenty-five Dollars; the name of the new Lodge to be "Isaiah Thomas" and the fourth Thursday of each month to be the Regular Communication of the new Lodge. All Masonic Lodges in Worcester having consented to the petition, dispensation was granted by Most Worshipful Arthur D. Prince, Grand Master, on the Sixteenth day of February, A.D. 1920, A.L. 5920, who appointed Brother Frederick W. Leavitt as the first Master, Brother Matthew John Whittall, Senior Warden and Brother Edward M. Woodward, Junior Warden. The first Regular Communication of Isaiah Thomas Lodge was held in the Middle Chamber, Masonic Temple, Ionic Avenue, Worcester, Mass., Thursday, March 25, A. L. 5920, A. D. 1920. During the months that followed with the Lodge under Dispensation, officers and members were occupied in preparing a code of By-Laws, selecting a pattern of regalia, a gift of one of its members, and making preparations for the constitution of the Lodge. Many items of historic interest as well as those needed for conducting the work of the Lodge were donated by Brethren, members, and neighboring Lodges. Among these was a piece of the coffin which bore the remains of the late Most Worshipful Isaiah Thomas, procured when the remains were raised from the Mechanic Street Burying Ground and transferred to Rural Cemetery on June 24, A.L. 5878. The following year was indeed a busy one in which 49 candidates were initiated. From its beginning, records show the charitable interest of the "Baby Lodge" as it was referred to. The Lodge grew in numbers and in status. Interests in all facets of Masonry were evident by the recorded words of its activities. Sincere, dedicated Charter Members laid a strong foundation on which the future of Isaiah Thomas Lodge would be built. A 100% attendance of officers and Past Masters was commonplace. In 1931, the records reflect the smallest attendance on record of the Lodge, it being ten officers and three members, but this was on Christmas Eve. During World War II, "V" Mail Committees were established to keep contact with our members, their suns and daughters serving in the Armed Services. During the first nine months of this effort, more than 2,000 letters were sent to servicemen and women by our members at home, and the response to this effort was evidence of its value. It continued so long as members were away. Thirty of our members were enrolled in services; one made the supreme sacrifice. Through the courtesy of Morning Star Lodge, jewels worn by officers on this occasion were those used when Isaiah Thomas Lodge was constituted. These were made by Paul Revere. These treasured jewels are worn by officers this evening through the thoughtful consideration of Morning Star Lodge. The twenty-five year history paid tribute to the Charter Members who were active in business and community life of Worcester, and with a keen interest in Masonry. Tribute was paid to the firm foundation they built for the Lodge and the Lodge complimented for its continued active part in the Masonic life of Worcester. And now another twenty-five years have elapsed as we gather tonight to celebrate the first fifty years in the life of Isaiah Thomas Lodge. It is difficult, indeed, for your historian to refrain from naming members with whom he has been associated intimately during many years, knowing their deep concern, untiring efforts; quietly but generously giving of their time and substance, promoting the tenets of their professions, not alone for Isaiah Thomas Lodge, but for Freemasonry and all that it represented to each of them, Yet so many who blazed the trail, leading to this occasion, some fifty years ago, who made similar sacrifices and contributions, and side by side with each of these, who perhaps were regarded as leaders, were many who by their support and contributions were equally responsible for the fruition of each effort. Without them, this day would have no meaning. We of Isaiah Thomas Lodge are deeply indebted to virtually an endless list of Brethren in each decade: those who organized the Lodge and guided it through its early years; those who struggled with production and security and complicated details of a nation at war, gas rationing, concern for safety of sons, daughters and neighbors, and the added burdens placed upon their Lodge, remaining loyal and tirelessly carrying out their responsibilities; those who contributed of their substances generously in establishing funds to insure aid for needy brethren, their widows and orphans; those who served in foreign lands in the armed services; those who organized and carried out the program of blood donations for the Red Cross; those who proudly wear a donor's symbol for having donated one, three, nine and more gallons of their blood; those who regularly visited brethren in hospitals and at home and who regularly drove to the Masonic Home to bring a group of our residents there to Isaiah Thomas Lodge to enjoy an evening with us; those who served in one or more capacities in the Grand Lodge and District; those who have been recognized for distinguished service; the officers and its seven secretaries and three treasurers; the loyal members who can always be counted upon to accept any assignment and see it through. Individual names are remembered for a brief period, but a part of each one of them in united effort and combined devotion to the Lodge they loved during these brief years of its existence, affords a heritage some 428 of us today are privileged to enjoy and proud to call Isaiah Thomas Lodge, our Lodge. We confidently look forward with these and many who will follow toward a promising future. On January 7, 1920, twelve brethren, representing the four Masonic Lodges in Worcester, met in the Director's room of the Masonic Temple, Ionic Avenue, Worcester, Massachusetts and expressed themselves in favor of petitioning the Most Worshipful Grand Lodge of Masons in Massachusetts to charter a new Lodge in this City and of becoming charter members of the same and inviting members of Worcester Masonic Charity and Educational Association to become Charter members with fees for charter members to be set at Twenty Five Dollars. The name of the new Lodge to be "Isaiah Thomas" and that the fourth Thursday of each month be the Regular Communication of the new Lodge. All Masonic Lodges in Worcester having consented to the petition, dispensation was granted by Most Worshipful Arthur D. Prince, Grand Master, on the Sixteenth day of February, A.D. 1920, A.L. 5920 and appointed Brother Frederick. W. Leavitt as the first Master, Brother Matthew John Whittall, Senior Warden and Brother Edward M. Woodward, Junior Warden. The first Regular Communication of Isaiah Thomas Lodge was held in the Middle Chamber, Masonic Temple, Ionic Avenue, Worcester, Massachusetts, Thursday, March 25, A.L. 5920, A.D. 1920. During the months that followed, with the Lodge under Dispensation, officers and members were occupied in preparing a code of bylaws, selecting a pattern of regalia, a gift of one of its members, and making preparations for the constitution of the Lodge. Many items of historic interest as well as those needed for conducting the work of the Lodge, were donated by brethren, members, and neighboring lodges, among these was a piece of the coffin which bore the remains of the late Most Worshipful Isaiah Thomas, procured when the remains were raised from the Mechanic Street Burial Ground and transferred to Rural Cemetery June 24, A.L. 5878. On January 19, 1921, the one hundred seventy second anniversary of the birth of Isaiah Thomas, following a banquet, Isaiah Thomas Lodge was duly constituted by Most Worshipful Arthur D. Prince and his suite of Grand Lodge Officers. From its beginning, records show the charitable interest of the "Baby Lodge" as it was referred to and grew in numbers and in status. Interests in all facets of Masonry were evident by the recorded words of its activities, interests in the Masonic Home; sincere dedicated charter members laid a strong foundation on which the future of Isaiah Thomas Lodge would be built. A 100% attendance of officers and past masters was commonplace. In 1931, the records seem to dismay at the smallest attendance on record of the Lodge - it being ten officers and three members, BUT this was on Christmas Eve. Through the generosity of a member, a substantial Charity Fund was established for the aid of distressed brethren, their widows and orphans, By-law changes were made to perpetuate the fund. During World War II, "V" Mail Committees were established to keep contact with our members, their sons and daughters serving in the Armed Services. During the first nine months of this effort, more than 2,000 letters were sent to servicemen and women by our members at home and the response to this effort was evidence of its value - it continued as long as members were away. Thirty of our members were enrolled in services, one made the supreme sacrifice. On January 17, 1946, Most Worshipful Samuel H. Wragg and his suite, one hundred forty-five members and guests attended a banquet in the Masonic Temple, Ionic Avenue, Worcester, Massachusetts, to commemorate the twenty-fifth anniversary of Isaiah Thomas Lodge. Through the courtesy of Morning Star Lodge, jewels worn by officers on this occasion were those used when Isaiah Thomas Lodge was constituted and were made by Paul Revere. Those treasured jewels are worn by officers this evening through the thoughtful consideration of Morning Star Lodge. The twenty-five year history paid tribute to the charter members who were active in the business and community life of Worcester and with a keen interest in Masonry. Tribute was paid to the firm foundation they built for the Lodge and complemented the Lodge for its continued active part in the Masonic life of Worcester. And now, another twenty-five years have elapsed as we gather tonight to celebrate the first fifty years in the life of Isaiah Thomas Lodge. It is difficult indeed for your historian to refrain from naming members with whom he has been associated intimately during many years, knowing their deep concern, untiring efforts; and quietly but generously giving of their time and substance, promoting the tenets of their professions not alone for Isaiah Thomas Lodge, but for Freemasonry and all that it represented to each of them. Yet so many who blazed the trail leading to this occasion some fifty years ago, who made similar sacrifices and contributions, and side by side with each of these, who perhaps were regarded as leaders, were many who by their support and contributions were equally responsible for the fruition of each effort. Without them, this would have no meaning. We of Isaiah Thomas Lodge are deeply indebted to virtually an endless list of brethren in each decade; those who organized the Lodge and guided it through its early years; those who struggled with production and security and complicated details of a nation at war gas rationing, concern for safety of sons, daughters and neighbors, and the added burdens placed upon their Lodge, remained loyal and tireless in carrying out their responsibilities; those who contributed generously of their substance in establishing funds to insure aid for needy brethren, their widows and orphans; those who served in foreign lands in the armed services, those who organized and carried out the program of blood donations for the Red Cross; those who proudly wear a donors symbol for having donated one, three, nine and more gallons of their blood; those who regularly visited brethren in hospitals and at home and who regularly drove to the Masonic Home to bring a group of our residents there to Isaiah Thomas Lodge to enjoy an evening with us; those who served in one or more capacities in the Grand Lodge and the District; those who have been recognized for distinguished service; the officers and its seven secretaries and three treasurers, the loyal members who can always be counted upon to accept any assignment and see it through. Individual names are remembered for a brief period, but a part of each one of them in united effort and combined devotion to the Lodge they loved during these brief years of its existence affords a heritage some 428 of us today are privileged to enjoy and are proud to call Isaiah Thomas Lodge our Lodge and we confidently look forward, with these and many who will follow, toward a promising future. Now, seventy five years have passed. The strength of social organizations is not what it used to be before television altered peoples' habits and reduced their needs for social interaction. Nevertheless, the appeal of Freemasonry is, as it has always been, to the loftier elements of human character and it will continue to attract men of serious purpose, who are dedicated to self improvement while joined together in an exceptionally warm and fraternal union. Our Lodge is presently showing increased vitality in the number of new members, and we look forward to further growth in the next twenty-five years. In 1995, a total of eight new members joined our Lodge. 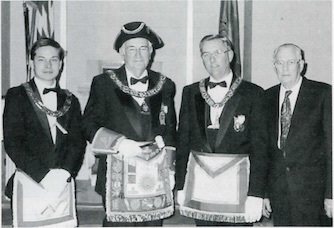 On March 20, 1993, Isaiah Thomas Lodge of Worcester held a reception to honor R. W. John W. Hanson, Senior Grand Warden. M. W. David W. Lovering, Grand Master, was received into the Lodge and was accompanied by a large and distinguished suite, including R. W. Carl A. Gordon, Deputy Grand Master; R. W. David A. Davies, Junior Grand Warden; R. W. E. Joel Peterson, Grand Marshal; and several other Grand Lodge officers and Past Grand Masters. M. W. Whitfield W. Johnson, the senior Past Grand Master, was present, and special recognition was accorded him. The reception committee was comprised of holders of the Degree of Chevalier in the Order of DeMolay chaired by Wor. Burton B. Shaw, senior Past Master of the Lodge. The other Chevaliers on the committee were Wor. Henry B. Rand, Athelstan Lodge; Bro. Scott R. McDuffie. Montacute Lodge; Bro. Windsor H. Bigelow, and Bro. Scott H. Bigelow, Joel H. Prouty Lodge. One of the highlights of the evening was the presentation of the Senior Grand Warden's jewel by Bro. Walter W. Hanson, father of R. W. Bro. John. A fine dinner was served in the banquet hall following the ceremonies. Wor. Michael A. Tillery. Master; M. W. David W. Lovering, Grand Master; R. W. John W. Hanson. Senior Grand Warden; and Bro. Walter W. Hanson. This page was last modified on 27 April 2016, at 18:25. This page has been accessed 20,006 times.